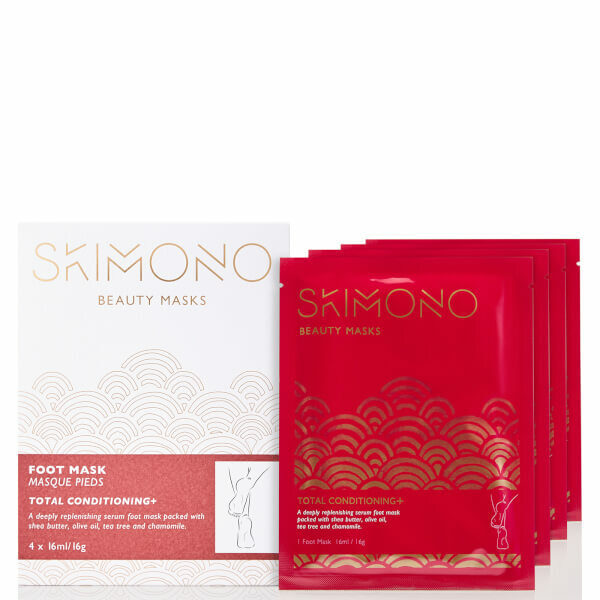 Pamper tired feet with the Beauty Foot Mask for Total Conditioning; an intensive treatment specifically designed for the feet created by Skimono, a London-based brand inspired by Asian beauty trends who aim to provide a solution to the damaging effects of pollution, sun damage and stress. The sock-like foot mask is made from naturally-derived bio-cellulose, with a three-dimensional matrix structure that has been saturated in a unique serum to maximise absorption capacity. It boasts hydrophilic properties able to retain up to 200 times its dry weight in serum with ultra-thin, tightly-woven crystallinity fibres, which closely adhere to every contour for optimum penetration. A deeply hydrating formula balances Shea Butter and Olive Oil to provide moisturising properties, helping to soften hard skin and smooth away cracks. Extract of Tea Tree and Chamomile deliver an anti-bacterial action with an instant cooling sensation to refresh and revive aching soles. The biosynthetic socks allow skin to breathe, working their magic within 30 minutes to reveal feet that feel sumptuously soft and supple. Use to prepare for a big day, or after to recover. Free from parabens and toxins. Pack of four individual pairs. Step 1: Start with clean and dry feet. Remove sock masks from sachet and separate along the perforations. Step 2: Carefully open the sock to reveal an inner layer with serum. Slip your feet into the inner layer containing the beauty serum. Step 3: Seal the mask around the ankle with the sticker tabs. Gently massage the mask evenly over the feet to promote even distribution of serum on the skin. Step 4: Leave the socks on for 20-30 minutes. Remove the socks and discard. Massage any remaining serum into the feet. No need to rinse.